﻿ Therapeutic change is often paradoxical. Dean Goodchild's therapeutic model. 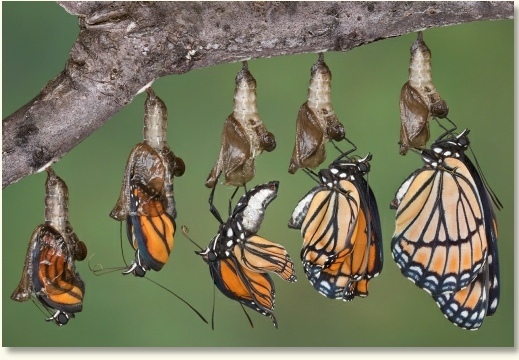 The caterpillar-chrysalis goes through the most amazing changes to become a beautiful butterfly. This French proverb means, ‘the more something changes the more it remains the same’. (Apologies, if I am not perfect on this, French is not my best subject). If you have ever tried to improve yourself and have found it hard, you are not alone. Yet, people can and do change. We all have a natural drive for health and life. Yet often changing seems to be so hard it is nigh impossible. The more you try to be different, the more it seems that you will stay the same for ever. If you were a caterpillar, you would not become a butterfly without becoming a chrysalis first. In a way, I act as the chrysalis shell, which is not a very flattering thought! If the first step of your journey feels like walking through treacle, you may decide to stay at home. Yet, if you want to reach the ‘butterfly level’ and you are prepared to endure ‘a chrysalis stage’ on the way, then I can help you. Oh by the way, I am not saying that I can actually turn you into a butterfly–just to get that straight! It’s a metaphor for therapeutic change at the Robin Corner Practice. What is therapy like and how does it work? I am experienced in several different approaches including CBT. Cognitive Behaviour Therapy has been clinically shown to be effective for Depression and Anxiety problems among others and this is why many NHS practitioners use this approach. However, classical CBT is less effective for longer term problems that may have begun during childhood. Where the problem is more complex I still work with thoughts, feelings and experiences but my therapeutic technique is based on an integration of approaches. Specifcally, I rely upon my knowledge of Attachment Theory, Mentalisation Based Psychotherapy and Systems theory. However, I always listen out for issues of power imbalance in relationships. This is a very brief resume because I use the full range of my training in sessions when required. As part of my training I have experienced being a client, in therapy myself, I can assure you that change is possible. In the sense that you are already asking yourself questions, it is working already! If we are working within a set number of sessions, you bring your objectives and I will tell you what would be reasonable to expect. Sometimes, it is not helpful to think like that. For instance, if you are in the process of a divorce or separation and you are feeling overwhelmed by your emotions then it may be that it is more important for you to work through the current trauma, resolving the immediate problems first. If, in the first session, I believe that I cannot help you to work on the problems with which you present, I will tell you so and if necessary refer you to an appropriate service. So how does healing happen? Just like our French proverb above, psychological change is often contra-intuitive too. Paradoxically, sometimes it is the very desire ‘to repair’, that harms people and maintains their problem. It is not always easy to know whether you can ‘see the wood for the trees’, sometimes you need outside help. Therapeutic change often results from making that distinction. That is, loosening up our conceptual structure and allowing alternative ways of understanding our lives. This can be quite hard to do and sometimes it is emotionally painful. As a therapist, I don’t have all the answers but as you search for the answers that you need, I can support you in doing so.